CRAZY DISCOUNT! Was: $259.95 Now: $159.98! 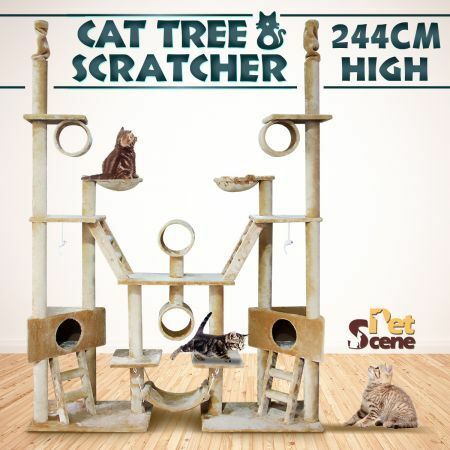 Give your cat freedom and room to exercise and play with this Brand New Multi-Level Cat/Kitten Activity Centre. This unit has everything your furkids could ever wish for! Multiple levels with plush covered platforms, this play center features a multi-level design allowing your furry friend space to pounce and leap between platforms. Features multiple ladder steps for climbing, hiding holes for sleeping and playing, tunnel to jump through, sleeping cradles as well as a resting hammock for afternoon naps. This Cat Tree is approximately 244cm tall so they can sleep or perch at the top to survey their kingdom. They can also use their claws to scratch and play which maintains their claws, saving your furniture, curtains and yourself from damage. Made of durable plush fabric material that will withstand constant use and have your cat coming back again and again. Easy to set up and assemble with all screws provided (minor assembly required). Easy to clean, simply wipe down with a damp cloth and vacuum. A hanging mouse toy lets them play and keeps them entertained. Providing endless fun for your cats, this huge play center is covered with long lasting soft plush fabric to allow your cats to snooze and relax in extra comfort. Cats enjoy taking cat naps and sitting in warm areas whilst perched up high. This Multi-Platform Gym is perfect for satisfying their needs. Great addition to your home to keep your furry friend healthy, happy and in tip-top shape. (L x W x H) 180cm x 44cm x 244cm approx. (L x W x H) Box 1: 75cm x 46cm x 33cm approx. Box 2: 46cm x 46cm x 33cm approx. Package Weight Box 1: 28kg approx. I received my cat play gym in record time. It took a while to assemble but totally worth it. The carpet is lush and fits together perfectly. The gym is well built and my cat loves it. Excellent value. I highly recommended crazysales cat play gym.